Who are the authors of the crop circles? Angels or elemental beings ? 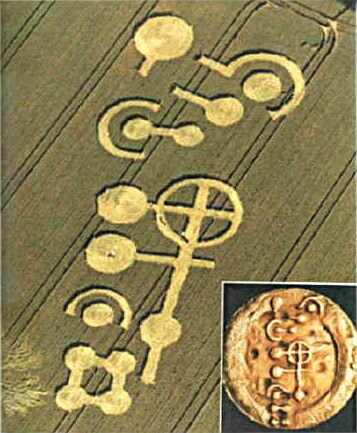 If we have understood that the crop circles are messages, or signals, sent by intelligent beings unknown to humans, and destined to humans, to all mankind, the question of the identity of their authors is evidently essential, and the question of the meaning of these messages is still more fundamental. Immaterial intelligent beings, or who would be capable of dematerializing themselves : we can designate them as spiritual beings, or to use another language, living beings from another dimension or another plane of existence. 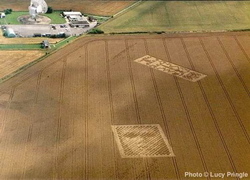 Two very different types of crop circles from the ones described previously appeared in England these last years. 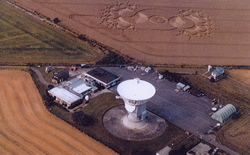 The first in 2001 at the foot of the astronomical observatory of Chibolton, consists of two parts : the representation of a « humanoid » face from one part, and a rectangle containing a grid of points from another part, called the Chibolton message, from the name of the observatory (photos 1 and 2). This message was able to be easily decoded when one perceived the crop circle looked a lot alike the visual representation of the message sent by a team of astronomical researchers in 1974 to distant stars, in the research program on the existence of other intelligences in the universe. This American program SETI (Search for Extra Terrestrial Intelligences) headed by Carl Sagan, had sent a coded message in the form of electromagnetic waves with theArecibo telescope (Puerto Rico). When we represent this message in visual form (photo 3), we realize indeed that its structure is very similar to that of the message discovered in the field of Chibolton (photo 4), which indicates that the code used is the same. However, differences appeared which permits considering that the message of Chibolton constitutes an « answer « to the Arecibo message. Knowing then the codes of these messages, the answer could be decrypted. 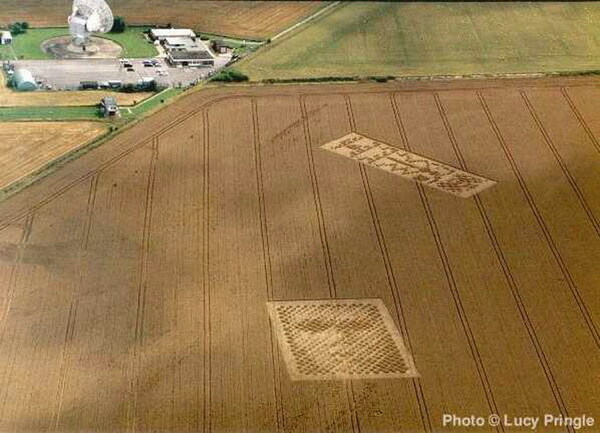 In the same way that humans « present themselves » in the message sent at Arecibo in 1974, the author of this crop circle has given a few indications about his identity in this message received at Chibolton in 2001. However, these indications are obviously subject to discussion, and do not give an explicit answer (see the proposition of an interpretation below). 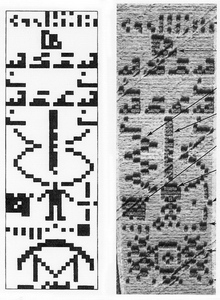 The messages of Arecibo and of Chibolton read from top to bottom. In the superior line, numbers are indicated from 1 to 10 expressed in binary code. This line is identical in the two messages. Below appears, in the Arecibo message, the atomic numbers of the principal elements that constitute the DNA of the human body, namely hydrogen, oxygen, carbon, nitrogen, and phosphorus. A first difference appears in the Chibolton answer : the element silicon was added, signifying that the author of this answer possesses also silicon in his DNA, in addition to the same elements as us. Further down, along four lines, we find the chemical formulae of the nucleotides which constitute the basis of human DNA. The same molecular formulae appear in the answer-message, which shows that the physical constitution of their authors is really close to that of human beings. Below we find a simplified schema of the DNA molecule, with the number of basic nucleotides which constitute it. In the answer, we easily see that the corresponding molecule from the authors of the answer is more complex. Then below and in the centre, the representation of the silhouette of a human being with (on the right) the average size (1,74 m) and the world population in 1974 (4,29 billion). In the answer message, we discover the silhouette of a being represented with a huge head, small size (1,01 m), the corresponding population being 21,3 billion. Below we have, in the Arecibo message, a representation of the solar system with the sun (right) and its nine planets. The third planet (starting from the sun) is shifted to signify that the human being, authors of the message, inhabit this planet : the Earth. The four following planets that are giant planets are represented with greater dimensions. In the answer message of Chibolton, we have equally a star and its nine planets, that give then, information on the stellar system occupied by the authors of the message, but the code used (chosen by man) did not foresee giving more precision ! We find ourselves confronted with this coincidence that the stellar system possesses the same number of planets that our own solar system : is it significant ? I propose the working hypothesis, even if it can seem extravagant, that the two systems could well be the same. In this hypothesis, the author would be present on the shifted planets : number three (the Earth), four (Mars) and five (Jupiter). However, this fifth planet is not represented simply as in the initial message of Arecibo. We have here a gathering of four « points » that reminds us of the four principal satellites of Jupiter. Yet it is just that the planet Jupiter is a gaseous planet, so unfit for material life but it possesses four principal satellites of a telluric nature (that Galileo had observed first with the help of his telescope). It possesses in reality a great number of others, but they are smaller sized. This representation of what could be the four principal satellites of Jupiter tends to give a bit of weight to the preceding hypothesis. 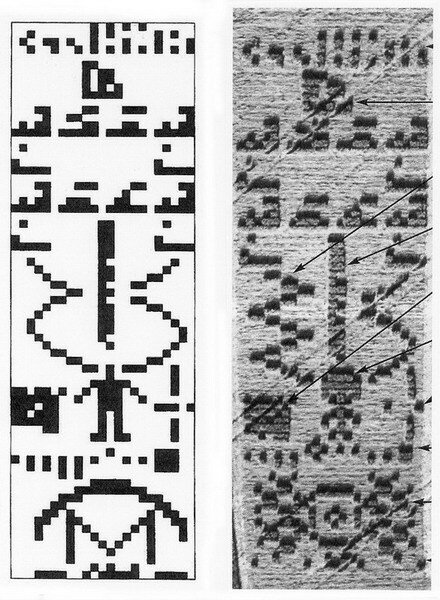 At the bottom of the Arecibo message we find a schematic representation of the telescope that served in the emission (we can see the source of the signal in the centre, the one being reflected symmetrically by the mirror towards the bottom), with its geometric characteristics. At the bottom of the Chibolton message, we are then supposed to equally find a representation of the instrument that served in the emission of the message. 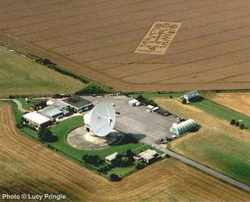 Yet the specialists agree to see in this representation a (simplified) copy of the crop circle appeared the previous year (in 2000)... at the foot of the same telescope of Chibolton (photos 5 and 6) ! 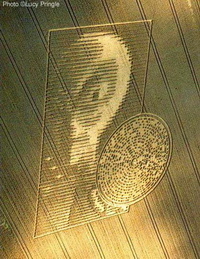 We can see in this crop circle of 2000 an antenna, represented by a fractal image : the central circle divides itself into two circles to the right and to the left ; then each of them divides again in two, and so forth, terminating each time by three points of suspension... like an electromagnetic beam that divides itself progressively and diffuses in the space until infinity. 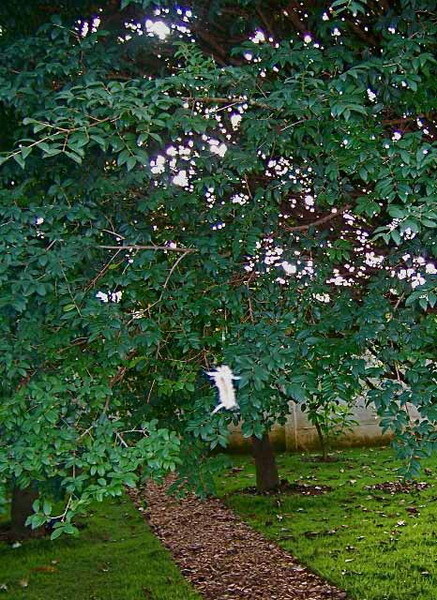 However, the fact that this antenna, that is supposed to be the instrument with which the message of Chibolton has been sent, is situated at the foot of the observatory, could well translate the fact that the message was sent from this same spot ! That is to say that the author is present in that place ! Otherwise said : he is amongst us ! This conclusion that may seem extravagant is in any case coherent with the preceding hypothesis that the author would be present on Earth ! It is evident that all the reasoning is perfectly questionable and does not amount to a demonstration, but it presents the advantage of being coherent. It would tend to show that the author of the Chibolton message is a humanoid type being (see the face associated with the message) but with a small body and a big head (in comparison with man). However, his civilization could be present on several planets of our solar system (such as Earth !). 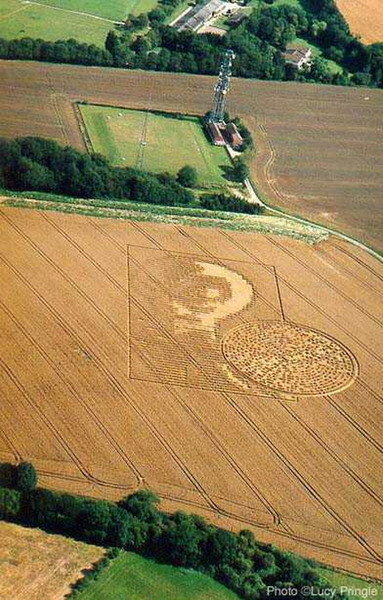 His body would not have the same density as ours because he made this crop circle at the foot of the observatory without having been seen, they would possess apparently then the capacity to make himself invisible, that is to say, to dematerialize himself. Science fiction or reality ? The crop circle of Chibolton in any case was quite real. 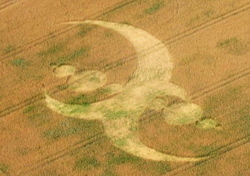 The second crop circle of a different type appeared in 2002 at Crabwood, near the town of Winchester, in the same region as the previous one. 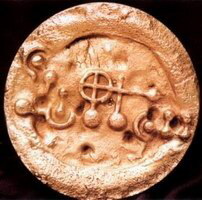 It represented also a face, but of a different kind (an alien type), associated with a disk in which was, as if « imprinted », a message (photos 7, 8 and 9). We see indeed a series of « points » aligned on a spiral, which inevitably makes us think of a compact disk containing information imprinted on a lecture track. This message was easily able to be decoded because it proved to be the translation in ASCII language (computer language) of a text written in English. This text does not give an explicit answer about the identity of its author either, but the face associated would indicate that the author would be « extraterrestrial » being of a different type from human, and different from the author of the Chibolton message. We must realize that this crop circle is the first and last to this day, it is the only one containing a written message in a human language, English transcribed in ASCII code. These two crop circles are completely original and absolutely unique. Not only are these the only two that represent a face amongst the thousands of observed formations until now, but these are also the only two that contain an explicit message with intelligible information addressed to humans. This could also make us suspect to human trickery, but we must notice that the Chibolton message for example was realized almost under the windows of the observatory in which a great number of meteorologists work around the clock, and in a field in which the access is prohibited. Moreover, the techniques of expression used in the first message, (grid points in a rectangle) like in the second (line of point aligned in a spiral in a circle) are also completely original. A few formations from the last years represent well a disk with a series of points, but in these cases, they remain purely geometric, without any explicit content of a coded message. 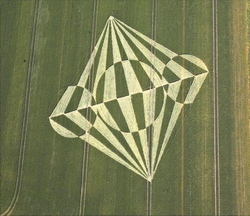 On the other hand, the thousands of crop circles that have been observed since the beginning of the 1990's (when the authors exceeded the stage of circles and segments) have a relationship often evident with sacred geometry, or with esoteric symbolism, or with some mathematical or physics theories, etc... but never contain explicit and intelligible messages as in the two preceding cases. The crop circles being thus classed in two categories quite distinct, we think the authentic crop circle authors can also be classed into two different categories (at least). Concerning these two coded messages, the first one describes a small sized individual (approx. 3 feet tall) with a big head, the second one shows a face very unlike that of a man's. This leads us to think that the authors have a body just as we do, but different from our human body. These observations lead to the conclusion that they deliberately present themselves as extra-terrestrial beings of a humanoid type, according to the usual terminology. 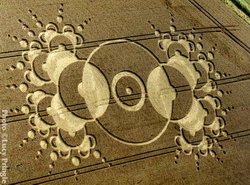 Therefore it seems that both these crop-circles tend to confirm that two different extra-terrestrial civilizations have revealed themselves at least once on Earth and would be present among us; two civilizations obviously more advanced than ours, whose representatives would be living in another dimension than ours and capable of making themselves invisible to us. Nevertheless a deeper analysis of the Chilbolten message leads us to very different conclusions. The clues contained in this message are of two kinds apparently contradictory : on the one hand, the constitution of the physical body of the author is very close to that of a human body, which leads us to believe that the author could in a way belong to our human species; on the other hand several indications such as the presence noted on three planets, the total population and the author's small size tend to differentiate him from the human species. These apparently contradictory clues have been reconciled in the light of esoteric knowledge of the human nature (practically unknown to most), in particular of the process of anthropogenesis (the appearance of man on earth and his evolution). Hence, the perfect correspondence between these clues and the ancient knowledge of human nature confirms the interpretation according to which the author of Chilbolton really does belong to our species but remains distinct, due to his very high level of evolution. The clues in the message even allow for a surprisingly accurate portrait of him. This interpretation, which requires previous acquisition of very ancient esoteric knowledge, cannot be presented in the limited frame of this web site. 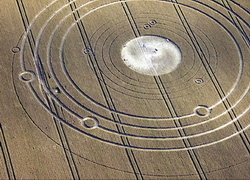 It is developed in the book « Crop Circles : the Chilbolton Revelation », published in French, on the look-out for publication in English. This novel interpretation, surprising at first glance, is backed by the perfect coherence of all the clues put together. It has considerable scope and offers a new perspective on mankind. Still we must distinguish between these two unique and outstanding formations and the thousands of other crop-circles of the other category. The remaining problem : we have seen that the crop circles are the work of intelligent and immaterial beings, present amongst us. Yet, modern man does not know such beings are present on Earth because for him, the only living beings that inhabit this planet are the multitude of beings from the animal world and human beings themselves, but men are the only beings endowed with intelligence and a conscience. It is what we have all learned by the education that we have received. It is why our questioning on the identity of the authors of the crop circles brings us naturally to imagine that these intelligent and immaterial beings come from elsewhere, come from space, hence the current proposed hypothesis of their extraterrestrial origins. Moreover, the existence of the two coded Chibolton and Winchester messages have actually reinforced this hypothesis, and the majority of people have come to believe that the authors sought can only be much evolved extraterrestrials, originating from another star system. However, long ago humans still knew of the the existence of spiritual beings on Earth, our ancients knew indeed of beings that the Judeo-Christian tradition calls angels, archangels, and all the spiritual hierarchy, that are described as being more evolved that man. They knew also of the existence of elemental beings, sometimes called nature spirits because they are responsible for the forces of nature, for the growth of plants for example. But our modern civilization marked by the predominance of the intellect and the reign of rationality, by a technological development that increases exponentially and an ever growing attachment to material goods, made us lose all sensitivity to subtle things, made us lose the sense of intuition, and made us forget this knowledge that has passed to the rank of myths and legends. However, these legends are part of ancient history of all peoples, at all latitudes, and we know that there is always a part of reality at the basis of these legends. Moreover, certain amongst us, that have received as a gift a certain sensitivity to the subtle, the mediums, the perceptive persons, but especially very young children, have the capacity of perceiving, or even seeing elemental beings in nature in particular (13-14-15). It so happens that people capable of seeing them (and only them) are naturally capable of photographing them (photos 10 and 11) and can hence bring elements of proof to others ! (with the condition of course of being able to surely avoid any fraud). And, even if this subject is little known, very numerous are the testimonies of scenes in which an exterior presence to us manifests itself, in order to save us from an imminent danger for example, or during an experience near the frontiers of death (NDE) (16). We are speaking of our guardian angel. Men are not the only intelligent beings in the universe - this idea is more and more taken into account today by scientists - but they are not the only intelligent beings on Earth either (17), even if this idea is still contrary to the current widespread opinion. 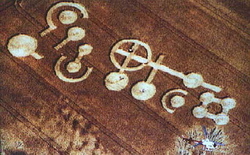 We think that the hypothesis of a terrestrial origin of the crop circles, that is to say that would be the works of spiritual beings connected to the Earth and present amongst humans, deserves and must be explored. This hypothesis leans on knowledge that our ancestors had of these spiritual beings, completed by contemporary works written on the subject and actual testimonies. The answer to the question : « which spiritual beings manifest in the crop circles ? » asks, before anything, to have a sufficiently large enough knowledge of the spiritual world. Yet it is clear that modern mankind has very little knowledge of this world since he has lost his capacities of direct perception.. According to history of religions as according to contemporary spiritual philosophers (17-18-19), the angels, archangels, etc. are spiritual guides for man and humanity. These angelic beings do not manifest themselves materially to us (they are not material) and it is why we do not perceive them. They manifest directly in our mind, during our sleep in particular, in an unconscious way for us. For example, each of us is accompanied in his or her existence by an angel (by a guide) that is one's own - guardian angel - and which we can sometimes sense its presence in key moments in our lives. They are more evolved than humans, and there exists a hierarchy between angels, archangels, etc. We can have an idea of these beings in imagining them like « perfect » entities, having developed all the noble qualities, and that are at the service of humanity. This idea of hierarchy - mankind, angels, archangels, etc. - makes then a call to the notion of evolution. This world of elemental beings is very complex, the very great variety of names that have been given to them is already evidenced : everyone is able of reading the tales in which fairies, elves, leprechauns, fauns, dwarfs, gnomes, undines, sylphs, etc. in some way intervene. 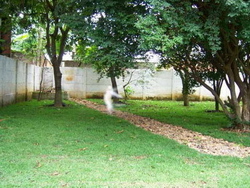 We can get an idea by imagining them as pure spirits at the service of nature. They are in charge of the growth of plants for some, or in charge of putting harmony in a place for others, or in charge of guiding birds or insects in their migrations, etc. But they have very limited possibilities of intervention in their area, and they do not have a direct relationship with men. Moreover, the majority amongst them is not interested in man : their attention is directed essentially towards the natural milieu in which they live and from which they are responsible, but they suffer precisely from the degradation of these sites, and they know that man is responsible for it. In the hypothesis of a terrestrial origin of the crop circles, that would be then created by spiritual beings linked to the Earth, should we seek this origin in beings more advanced than us, angels, or on the contrary in beings less evolved, the elemental beings ? If we consider the mysterious aspect of the phenomena that goes beyond our capacities of actual understanding, we are tempted to think that the crop circles are the works of beings more evolved than man, thus angelic entities. It seems difficult indeed to consider that these often magnificent works of art that testify to very elaborate knowledge can be created by beings less advanced than humans on the scale of evolution. 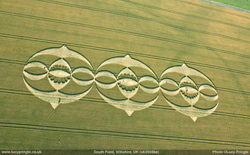 This very disconcerting hypothesis at first for the majority of us can be justified then validated in successively examining several characteristics connected to the crop circles. However, it asks to consider leaving aside all forms of displaced pride and placing oneself on the contrary in the attitude of humility before a concrete phenomenon that calls to us but is still mysterious for us. 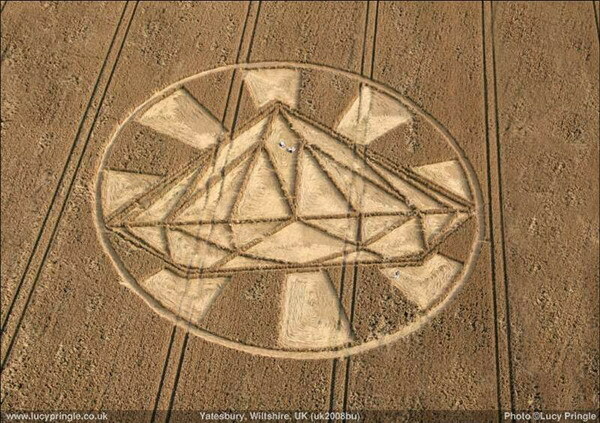 We have seen that the quasi-totality of the crop circles are of geometric type and distinguish themselves thereby from the two messages of Chibolton and Winchester. These last two address themselves to humankind in a coded but comprehensible language : the second message for example was expressed in English (with the help of the ASCII codes), which is the language most used by mankind. 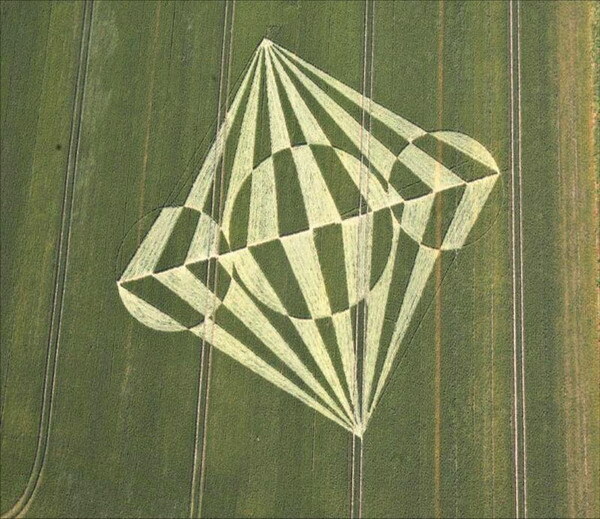 However, the crop circles of geometric type are realizations in which the authors call to mankind and manifest their existence, their presence amongst us, but they express themselves in a symbolic way by geometric figures, without using language so to speak. It is this absence of language moreover that makes these crop circles enigmatic and that makes that it is difficult for us to capture the real meaning. This must make us understand that these messages do not address themselves to our intellect, but first to our « heart », to our intuition and all the difficulty is there for us. Modern human is used to reasoning, to reflecting with his mental capacities, but these spirits cannot (do not know how to) use our language in order to make themselves clearly understood. This remark leads us to believe that it would be elemental beings that express themselves there rather than superior spiritual beings. 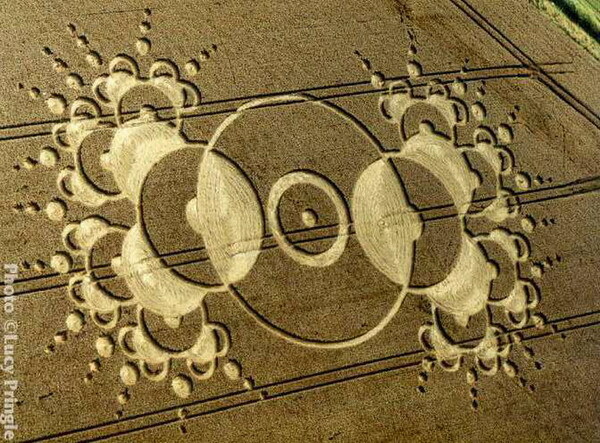 Focusing on all the crop circles, (of geometric type) observed throughout time, we realize that these realizations have not always been elaborated like today. 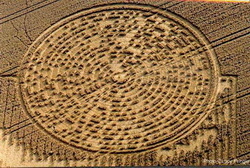 For a very long time - for centuries until the 1980's - it seems that all the motifs of the crop circles limited themselves to simple and small dimensions (a few meters in diameter only, while we observe currently today some formations of several hundred meters). 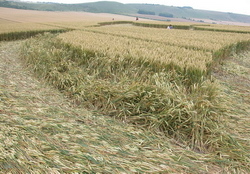 This great sobriety or simplicity of circular motifs accompanies moreover the « relative » simplicity of the techniques used : all the wheat simply laid down in the same direction inside the circle, around the centre. Then, near the end of the 1980's, the motifs enriched in adjoining straight segments to the circles. 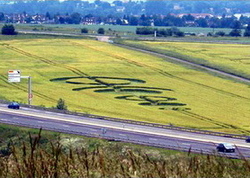 It is the time of great confusion where several men were surprised in the middle of creating counterfeit crop circles in England (we can notice that this anecdote is fit for England ; in no other country, have men been surprised in the act of creating crop circles ! besides, does proof exist that people have made these crop circles in other countries ?). It is at this period that the motifs have started to evolve really and became greater, more complex, and varied from year to year. We can notice that this evolution perhaps was necessary because of the discovery of the hoaxes, in order that the « authentic » creations can be differentiated from these hoaxes. We must also notice moreover that this evolution happens progressively, as if it had required an adaptation period of several years for their authors in order to refine the techniques. 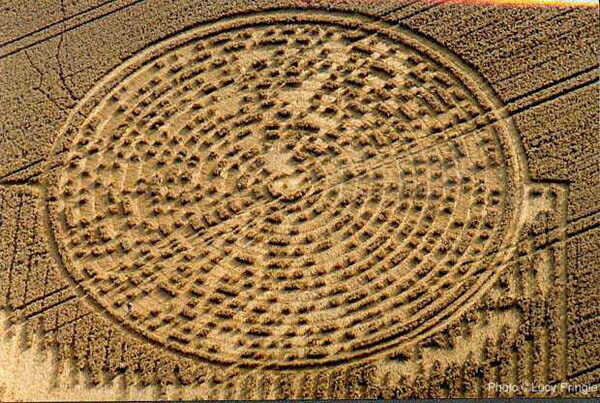 There has then been a very clear evolution of the crop circles throughout time in dimension, with at the same time an amazing progression in the complexity of the motifs represented, from the simplest motifs to the most elaborate. However, even if we focus habitually our attention on the most beautiful and elaborate formations, it is nevertheless true that in our time, in 2008 for example and in England, a small number of authentic crop circles are still very simple : circle or rings of small dimensions (photos 12 and 13). Thus, if we admit that the authors of today are the same as in the past, it is difficult for us to attribute the realization of little and simple circles to highly evolved beings. Seemingly, the progressive evolution of the represented motifs translates an evolution of the expressive capacities of these beings, an evolution that would not be shared by all. This observation tends to make us think the authors could be elemental beings, rather than from the superior spiritual hierarchy. In addition, it is striking to observe that since the represented motifs became more complex and spectacular, all these are practically concentrated in one and only one country : England. The represented motifs in France for example (photos 14, 15, 16 and 17), but also in the other countries, are on the whole clearly more simple, even if just a beginning of evolution appeared theses last years. The motif evolution in the other countries of the world is behind what is observed in England. 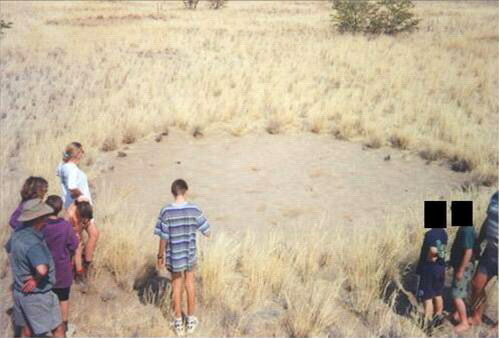 The same phenomenon of crop circles exists also for a very long time in southern Africa, in Namibia in particular. 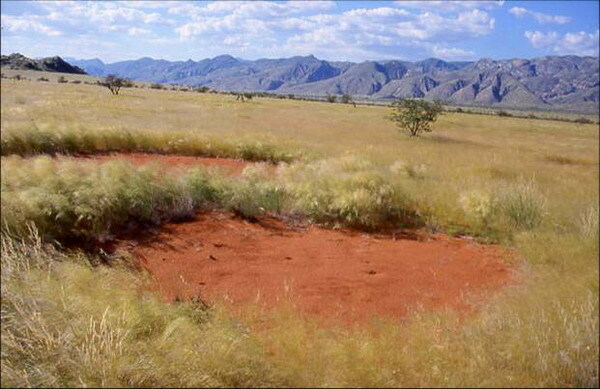 In a region of savannah where the natural vegetation is rare and limited to dry grasses, they manifest in little circles of a few meters in diameter in which the grass does not grow (photos 18, 19 and 20), A greater density of grass marks the border of these circles. These motifs are then we cannot say simpler, because there are not bent plants but simply an absence of plants (in uncultivated expanses). This expression mode could be considered as completely primary and does not show any evolution today. 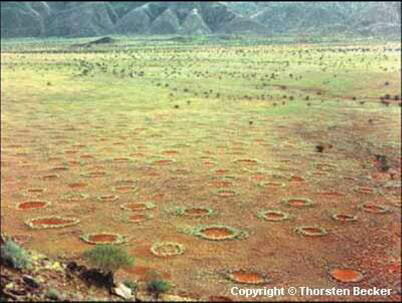 The people of the country, who do not understand this mysterious phenomenon, call them « fairy circles »...! It is interesting to notice this appellation. This observation that makes discrimination appear between the countries does not seem compatible with the idea that crop circles would be messages sent to humanity by beings belonging to the level of evolution of angels (or greater). It brings us again to think that the authors of the crop circles would be rather less evolved beings, who have few relationships between them according to the regions of the world. They could then belong to the category of elemental beings. Indeed, according to Rudolf Steiner, « gnomes have still another character trait : their quasi invincible instinct for independence and for freedom. All their attention is turned toward the exterior world and practically, they are not concerned about others. A gnome is little interested in other gnomes, but all that surrounds it however, interests it prodigiously. » This precision allows us to understand the disparity between the different countries (21). Otherwise, we can realize that even in the most magnificent and spectacular works formed in England, a small part of them present imperfections. 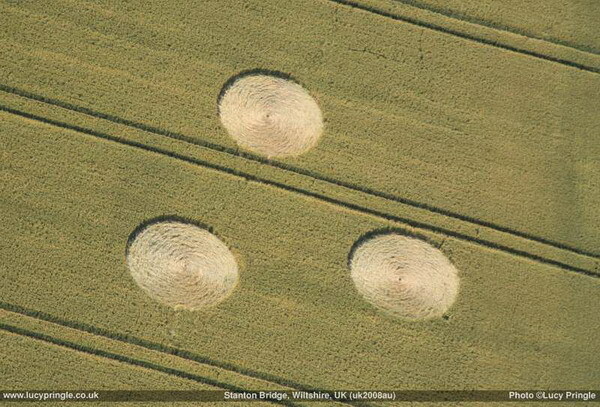 Limiting ourselves to the formations of 2008 in Wiltshire, four examples can be observed. A similar remark in the magnificent formation sometimes called « the swallows » or « the owls ». We can notice moreover that this formation has been realized in two times, throughout two consecutive nights (photos 23 and 24).In this case, the first part formed a coherent and harmonious whole, and then the drawing was completed the next day in order to form a more complex set, with a perfect connection between the two parts. Thanks to the fact that the added set is formed in several identical parts (several swallow representations), we can clearly realize, as well as from a plane (in the lower section to the left of the aerial photo) that from the ground, an imperfection on the border of a swallow (photo 25). 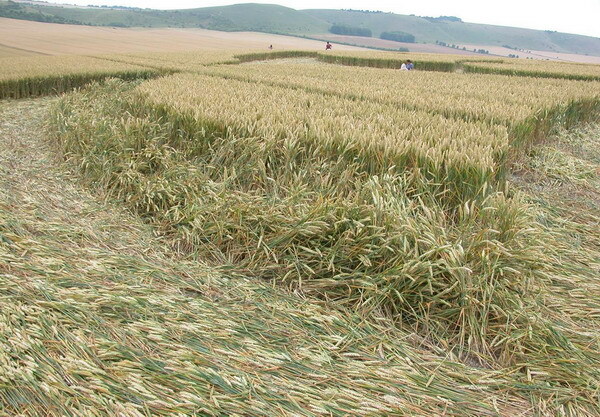 In this band, the wheat stems were partially and regularly inclined as if they had been laid down in a first time, and then awkwardly raised again, while they should have been left intact. It is clearly about an error. In the following formation (photo 26), we perceive clearly a fine line that spreads out from the central axis and that does not respect the symmetry and harmony of the motif. Another line equally appears at the top left of the image that does not seem justified. These two lines cannot correspond to any intermediary stage of the construction of the design. It seems that they are faults, since not represented on the outside of the formation. 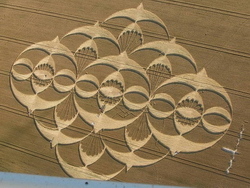 They are connected to the realization of the crop circle. Finally, in the representation of the solar system appearing in the field in Avebury, the observers have been intrigued by an « anomaly » with poorly defined contours in which the wheat have been irregularly bent (photo 27), near the planets Neptune and Uranus. It makes us think of the representation of a planet, but it is situated, in fact, between two orbits of planets. It does not correspond to anything in the solar system. There again, it seems that this « mark » is in fact an error, because once the wheat has been bent, it is not possible to erase an error committed. 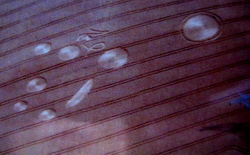 These little imperfections in the material realization of the crop circle seem to indicate that their authors do not have an absolute mastery of the methods implemented, which goes still in the sense that they could be elemental beings. 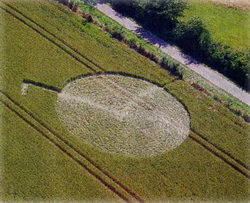 It is a unique crop circle by its characteristics, that appeared in Germany in 1991, and that is by itself a triple mystery ! It was discovered in a prehistoric sacred site, which dates more than 4000 years. The archeologists describe it as one of the most important cultural prehistoric sites. It consists of a gathering of circles, arcs, and a cross, all of it connected by line segments and measuring one hundred meters in length (photo 28). 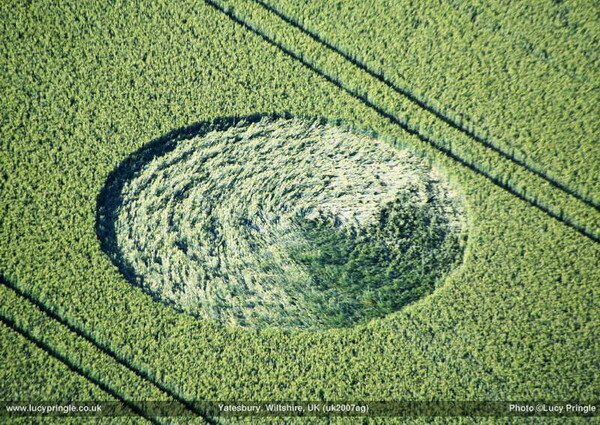 The first mystery is, of course, in the existence of this crop circle : by who and why ? Yet, a researcher, who was analyzing the place of the formation, equipped with a metal detector, discovered three metallic disks of the same dimension (about thirty centimetres in diameter), buried in the ground in the centre of the three circles surrounded by a semi-ring : one was in pure gold, the second was in 99.9 % pure silver, that is to say purer that the silver used today ! Its weight was about 5 kilograms and the third was made of bronze (photos 29 and 30). 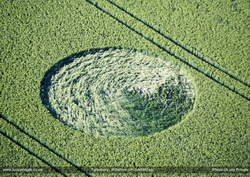 Michaël Hesemann, crop circles specialist, was able to study them and exposed them during a public conference in 1992. However, what is most surprising is that on each of these disks was represented the same motif, the same pictogram as the one that had just been drawn on the wheat field ! That is to say, the motif of the crop circle was in fact an exact reproduction of the motif represented on each of the three metallic disks ! 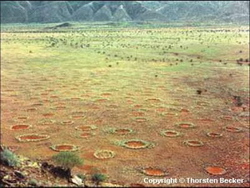 We can suppose that these disks were probably buried in the ground for thousands of years. Some spectrographic analyses have revealed that the silver and tin (contained in the bronze disk) were probably coming from a deposit near Grasdorf (the place of the creation of the crop circle). This coincidence of the motifs constitutes of course the second mystery. The third mystery being : why these three disks, similar but made of gold, silver, and bronze, showed this same motif ? Who or which civilization had made these disks ? Apparently a very ancient civilization present in this region of Germany and which had developed a surprising expertise. It is evident that these three mysteries are narrowly connected. 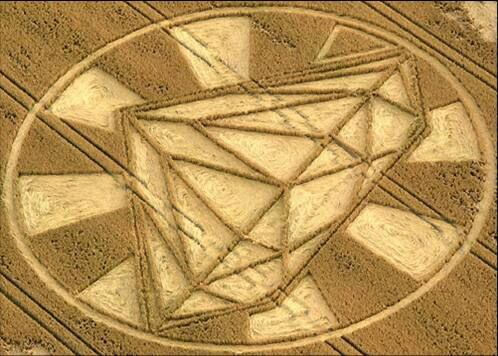 First, let us look into the question of the authors of the crop circle. I place myself, of course, in the hypothesis where all that has been reported is authentic, which seems to be confirmed by the analyses and the studies of Michaël Hesemann, in spite of the strangeness of the facts. It is evident that the authors had knowledge of these three buried disks, probably forgotten by men for thousands of years. These are then beings that have the vision of what is in the earth, beings whose vision goes beyond the material element earth, that is to say spiritual beings. In this precise case, the elemental beings connected to the earth element seem to be the best placed to answer the question. Rudolf Steiner explains that they can indeed move freely in the earth, and that they are most often near metallic terrestrial veins, they are then most attracted by the metal element ! 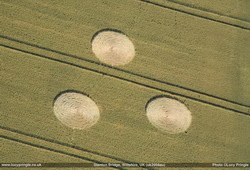 Because these are intelligent beings, it is evident then, by the realization of this crop circle, that they wanted to attract the attention of the man on these three disks, to attract our attention on this third mystery. Why ? We will come back to this point later. Although the hypothesis currently considered is that the crop circle should be created by « some extraterrestrials » from outer space, we would like to consider here the hypothesis of a terrestrial origin, by spiritual beings that live amongst us and are therefore, linked to humanity. There exists indeed very many diverse testimonies of the existence of angels as well as elemental beings. All the human traditions report many legends in which these spirits manifest. Their presence is attested to in the three monotheistic religions : « In the Talmud, the Jewish religious book, the gnomes are considered like guardians of the earth and of the under worlds... The Koran affirms that, in addition to the angels and man, God created djinns or genies. In the book of Enoch, who is a character cited several times in the Bible, not only are angels mentioned, but also the spirits responsible for the elements (13) » and in the Christian gospel, an angel appears to Mary. On the other hand, people gifted with extrasensory perception (young children in particular) are capable of perceiving them and for some, even seeing the denser elementals (gnomes and undines that respectively take care of the earth and water elements). Finally, the spiritual philosophers speak abundantly of these beings and explain that they are part of our world even if they are invisible to our senses. We have analyzed next the characteristics of the crop circles of geometric type. 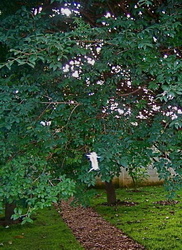 The absence of an intellectually comprehensible explicit message, the evolution of their dimensions and their complexity with time, the fact that this evolution does not exist throughout all the countries, and sometimes manifest errors in their realization, all that leads us to believe that the authors are intelligent beings but who possess limited means of action. These characteristics are not compatible with the hypothesis of an extraterrestrial origin of the authors, who should be necessarily very evolved beings. They would belong then to the family of elementary beings (or elementals). According to Rudolf Steiner : « The elemental beings are the intermediary between the Earth and the spiritual universe. The evolution that man has undergone throughout the actual period is responsible for the fact that he is no longer in the state of perceiving these beings as he sees the animals, plants, etc. of the physical world, whereas they could perceive them in ancient times. The gnomes, who are the beings linked to the earth, are extremely intelligent. These are beings of reason par excellence, and they have the clearest consciousness. They give their attention to the world that is exterior to them, to what surrounds them (21) ». After this description, we can understand that these elementals indeed, have every reason to worry about the irresponsible behaviour of human beings who no longer have respect for nature and who destroy the Earth because they are the first ones concerned. This is why they have decided to manifest themselves !